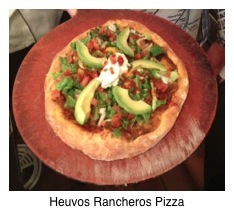 Huevos Rancheros Pizza | Cooking Wine And Travel - The site where Foodies Unite! Huevos Rancheros is my favorite breakfast. When we started designing pizzas for a new restaurant concept, I thought it would be fun to create a pizza using the same ingredients. This pizza turned out to be the crowd favorite at our menu tasting event. This recipe brings together sauces and mixes from several of our recipes, including our Refried Bean Sauce, Ranchero Sauce, and Karen�s Pico De Gallo, all of which can be found on our website. Turn your grill on to high heat and place the pizza stone directly on top of the grill. Adjust the flames so that they do not touch the bottom of the pizza stone. Close the grill lid and allow the stone to heat up for at least 20 minutes. When you are ready to make your pizza, liberally sprinkle corn flour over your pizza peel or baking sheet before rolling it out. This will prevent the pizza from sticking to the pan. Once the dough is rolled out on the pizza peel and before adding any ingredients, lightly brush the surface of the dough with olive oil. This will allow the dough to cook evenly and create a crispy, golden-brown crust. Gently spread the refried bean sauce over the dough leaving about 1⁄2 inch of the outside rim of the dough exposed. Generously cover the sauce with the grated cheese. Gently slide the pizza on the pizza stone by holding the peel at an angle and gently shaking it back and forth. You may want to have a spatula handy to help guide the pizza on to the stone. Cover the grill and bake for 10-15 minutes, checking at least every 5 minutes to make sure the pizza is not burning. You can use your spatula to gently lift the edge of the pizza and check the bottom of the crust. Depending on how you want your eggs cooked, crack open and place the raw eggs equally spaced around the pizza while it is still in the oven. I prefer my eggs over easy, so I wait until the cheese is melted and the pizza is about 1/2 cooked (about 5 minutes). The pizza is done when the bottom of the crust is a light golden brown and the cheese is fully melted. Using the pizza peel, remove the pizza. Spread the chopped lettuce, then the Pico de Gallo on the pizza leaving the eggs exposed. Drizzle pizza with 1 tablespoon of the Ranchero Sauce. Lay the sliced avocados around the perimeter of the pizza and sprinkle with the Jalapeño peppers. Mix remaining Ranchero Sauce with the sour cream and place at the center of the pizza.